For most of us, holiday stress equates to: too much money spent, hectic travel, extra pounds packed on, and plenty more. They all add up to a mountain of anxiety. Top that mountain with worry about pet care in your absence, and it’s enough to make you stay on the couch in pajamas while feeding your dog forbidden treats all holiday season long. One of the most convenient and reliable options for kenneling your dog or cat over holiday vacation is probably at your own veterinarian’s office, as most offer overnight stays. Your pet, of course, will be attended to properly, but the accommodations and hospitality options are probably lacking. After all, they are in business to keep pets healthy, not to read precious kitty bedtime stories each night. Plush pet care, however, is big business. The American Pet Products Association revealed we animal lovers spent almost $6 billion for pet boarding and grooming in 2016. The expectation is the number will grow in 2017. That’s a lot of pet pedicures! From the data, it seems pet families regularly seek boarding options beyond basic veterinarian’s kennels. What are some other alternatives to traditional pet boarding, and can military families afford them? First, and most likely the least expensive, is to contact friends and family and beg. Someone might owe you a BIG favor and it could be time to cash in. Or, in more friendly terms, propose a pet sitting swap. Most pets enjoy the company of other animals, but be sure that yours does before trying this. Otherwise, your best friend will call you everyday with misbehaving stories of your beloved in her charge, making you both feel terrible. There’s a wide and varied industry of pet sitters out in the world today. Some professionals come to your home, while others take your pet into theirs. Paid add-on options can include play time, feeding, walks, and overnight tending. Each company has their own payment systems and subscription services. Check out: Rover, Holidog, and the National Association of Professional Pet Sitters to find sitters that meet your qualifications. 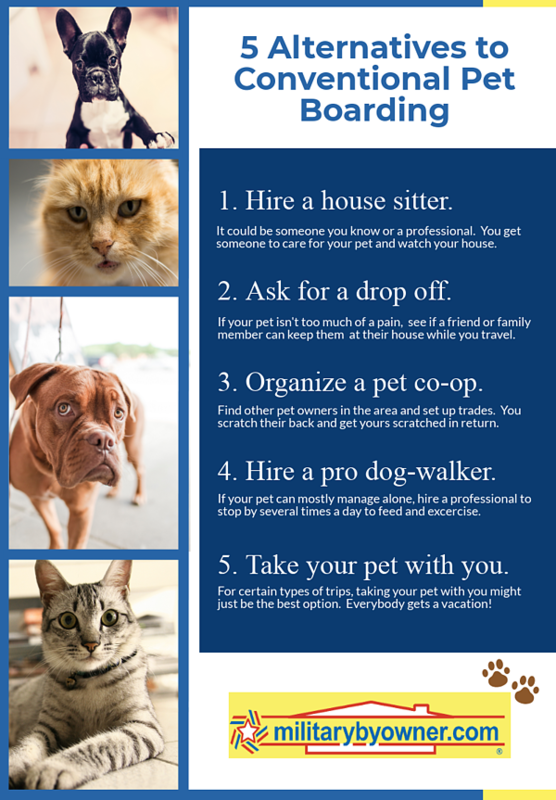 Hyperlocal options near your neighborhood also exist, and they might be less expensive if you can find the right pet sitter fit. Start with your own vet. Does she have a recommendation? Or does the vet tech or staff cat sit on the side? Knowing a trained veterinarian staff is in charge of your #1 pet removes some of the worry involved—at minimum, they’ll know where to take Mr. Meow if he gets sick. Don’t forget the tried and true Care.com, and your local edition of NextDoor. College kids home for holiday breaks always list their info to earn extra cash. You’ll also read candid reviews of your neighbor’s experiences with passionate warnings and recommendations included. Now, for the luxury outfitters. Small, boutique styled boarding facilities and large pet resorts have plentiful amenities to offer: pools, pampered grooming like facials, outdoor agility courses, and skylights (because of course, natural light is the best!). The list goes on as long as your paycheck can reach. 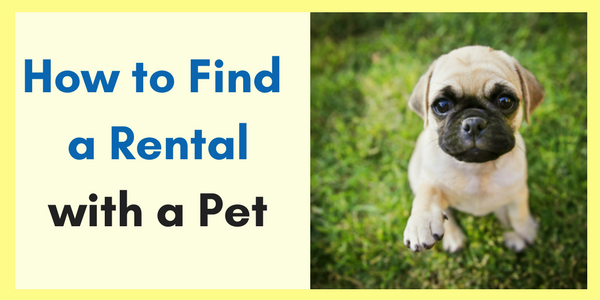 Pet owners definitely pay for piece of mind. Safety, health, cleanliness, and dedicated attention are normally touted as top priorities by these types of boarding facilities. You can expect an average night’s stay to be around $75 to $100, or a little less for cats. High-end pet resorts are usually located near large cities where expendable income is a norm and not an extravagance. Military stations might not fight that bill everywhere, but military heavy Washington, D.C. certainly has their share of fancy pet hotels, as do New York, Florida, and Texas. They aren’t hard to find in big cities. Remember to ask for a military or regular visitor discount. Rustic versions of a pet resort are lovingly referred to as country dog camps. These summer camp type boarding facilities are popping up more and more to please the most discerning of dog owners. 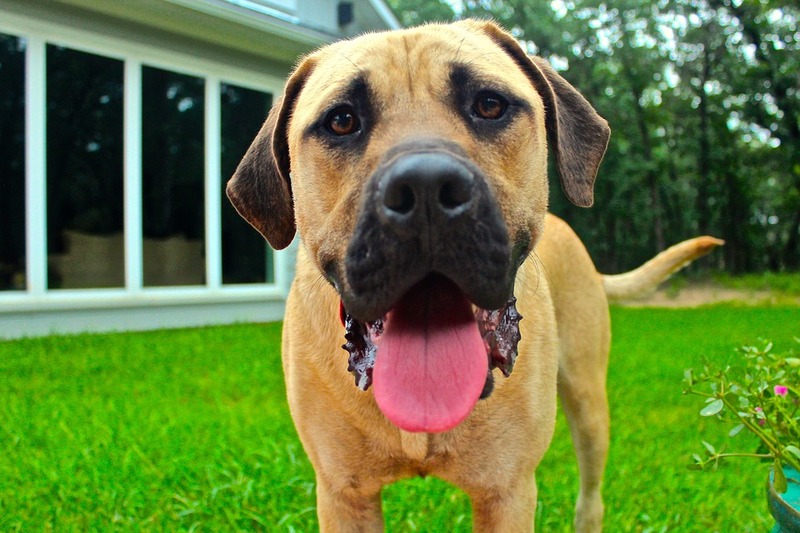 They offer wide open spaces with room to play all day with fellow dog friends within secured fields and ponds. Farm life living with responsible supervision are just two of the benefits to outdoor dog camps. A great example of free rein adventure is found at Country Dogs. Their locations provide pickup and delivery services of pets in areas of Maryland, Virginia, Pennsylvania, New York, and New Jersey. Vaccines: Legal and reputable operations require proper vaccinations and documentation for proof. For dogs who haven’t been kenneled before, they likely haven’t had the additional Bordetella vaccine. They’ll be required to have one before arriving. Overall Heath: Most companies will screen for temperament prior to drop-off and check the animal for sickness the day of check-in. Be aware that each boarding house has various rules for neutering. Some require the operation, but others will keep the intact animals separated from other guests. Check-Ins: Your pick of facilities should be more than happy for you to visit before leaving your pet. Request a tour and ask questions. They should also indulge any phone calls to check on your pet while you are away. Schedule: The best pet resorts are booked. Consistently. Everyone wants their pet to go to the best place, right? Holidays and peak vacation times are difficult to snag an opening if not done weeks, or more likely, months in advance. In case the above options don’t work for you, think about traveling with your pet. Hotels have become much more lenient with their guidelines and availability. Plus, pets in a hotel provide the perfect excuse to end a long day of mingling with relatives. As well, traveling with your pet and boarding him in a facility near your destination alleviates some worry if you can go and check on him each day. We are family to a two-year-old golden retriever and we factor in the cost of his resort stay into our vacation budgets. It’s expensive to be sure, and the all of the stress doesn’t completely disappear--I am a dog mom after all! But we check on him regularly via pet cam in his room with a window or during dog day camp. The one-on-one care and screening process is much, much better than a traditional veterinarian’s kennel, so I worry significantly less. Still, I draw the line at dog facials. Finally, after our second dog, we've found a great solution to our pet boarding needs. As the holiday season approaches, what options are you taking to provide Fluffy and Fido with the attention they deserve while you’re gone?